This program for the ISU vs. University of Minnesota football game, held on October 24, 1896, has seen better days. 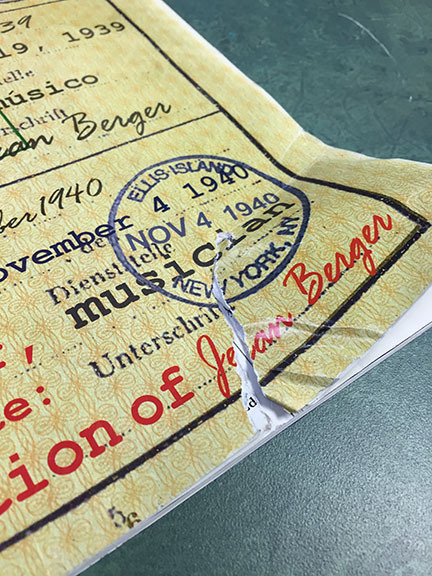 After being used as a scorecard, presumably by a fan who attended the game, rolled up (possibly by the same nervous fan), nibbled on by insects, and hastily put back together with two separate campaigns of pressure-sensitive tape, this object has finally arrived at the Preservation Lab for treatment prior to digitization. The treatment involves removing the tape holding the covers and leaves together and then reassembling the fragments and mending with tissue and wheat starch paste. The tape removal has been tricky so far, accounting for the majority of the treatment hours. Since there are two different types of tape, the ideal method for removing the carrier and reducing the adhesive residue has to be found separately for each kind. Removing the plastic tape carrier with a heated spatula. The plastic carrier is removed using heat (or peeled straight off, if the adhesive is degraded enough), and then the remaining adhesive is removed from the surface of the paper using a combination of erasers, heat, and mechanical reduction using a scalpel blade. In some cases, the staining from the tape adhesive can be removed with solvents. 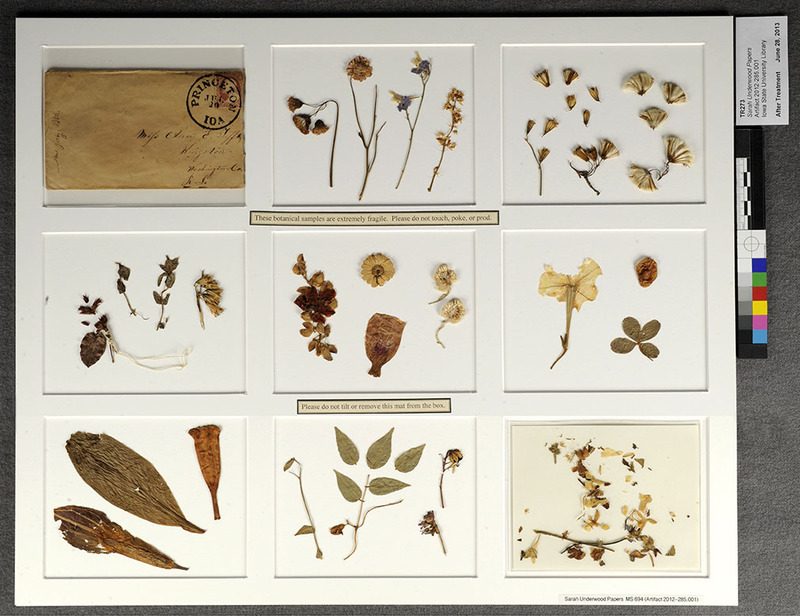 For this archival object, however, the aesthetic outcome of the treatment is less important than the physical stabilization, and the staining will be left untreated. 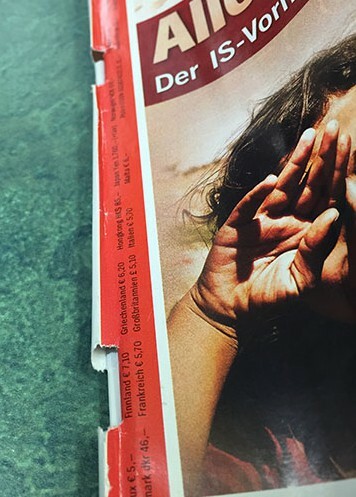 It was hoped that the booklet could be reassembled after mending, but it appears the individual leaves are too fragile for that level of manipulation and will be individually encapsulated in polyester sleeves. This program is one of hundreds in the University Archives’ ISU Dept. 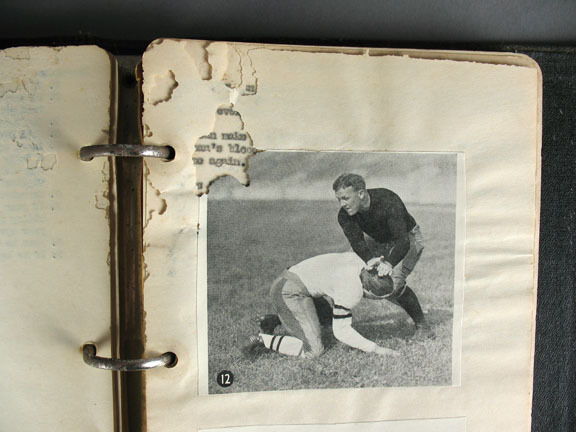 of Athletics Football collection that have been digitized for public viewing online. Early films of ISU football games will be showcased at a tailgating event, hosted by Special Collections and University Archives at the November 11th football game with Oklahoma State. Visitors to the library’s tent will be able to view objects from the collections, such as football programs from years past, banners, buttons, commemorative beanie hats and early photographs and learn more about the history of the University and the Athletic Department. 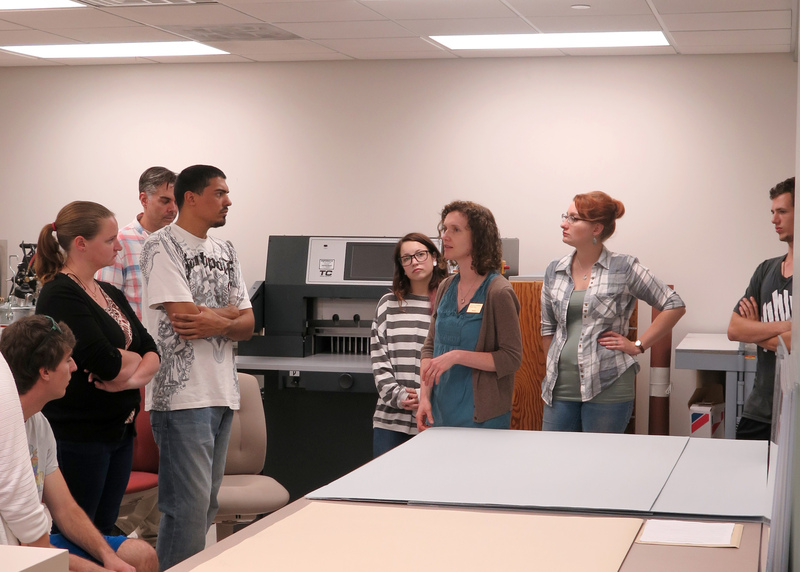 About a month ago, the Preservation Lab hosted a group of students taking an upper level class in Public History. In this course the students use archival materials as primary sources for the research they are conducting, drawing from the Library’s Special Collections and Archives. Spending time in the Preservation Lab gives them a behind the scenes look at what it takes to stabilize original materials so that they can be viewed in the reading room. As part of a practical introduction to preservation, I demonstrated some hands-on conservation techniques that are often used to repair archival documents. Working on a discarded photoreproduction of Marston Hall, I removed some tape with a heated spatula and mended tears using wheat starch paste and Japanese tissue. An interesting inter-disciplinary discussion happened around a group of WWII propaganda posters that were in the lab for conservation treatment. The posters were approximately 2 feet by 3 feet. They were staple-bound into a pad that was attached to a foldable easel made of cardboard. The instructor and the students talked about the use of this object as a presentation tool, a 1940’s PowerPoint presentation of sorts. The speaker could take the easel-pad along with them to give encouraging talks to the public about wartime efforts at home. 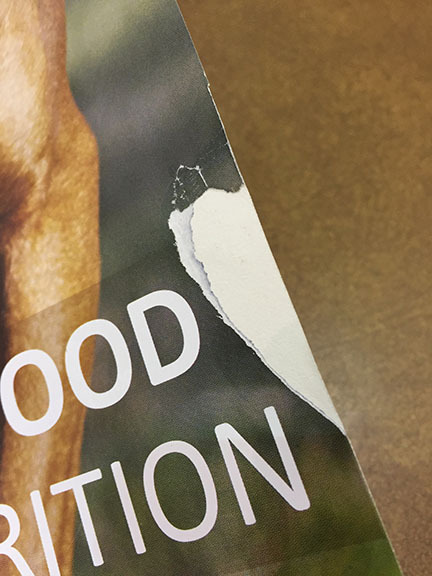 As you can see from the photos above, the top poster had gotten torn and became detached from the pad. If I were to take this object out of its historical context and to consider only its physical characteristics, I would want to take it apart, repair it and store all the components separately. The posters would go into one folder, while the easel and the staple binding would go into a different folder. Stored in this way, the posters would be safe and easy for scholars to handle without the assistance of an archivist or a conservator. However, the research value of this presentation pad lies in its format, which tells the story of its use as a WWII propaganda tool. So, my approach will be to disassemble the structure, repair the components and then to reassemble the binding using thread loops in place of the damaging rusty staples. The binding will be recreated, but slightly altered to provide more stability and longevity to the object, ensuring the preservation of both its physical self and its contextual meaning. This class discussion brought home to me the point that historians and conservators have an important conversation to carry out. In order to adequately preserve historic collections, we need to share our distinct areas of knowledge with each other, enriching each other’s understanding of primary source materials. While preparing serials to either be shelved or prepared for binding, I often discover or receive damaged issues from other Library employees. 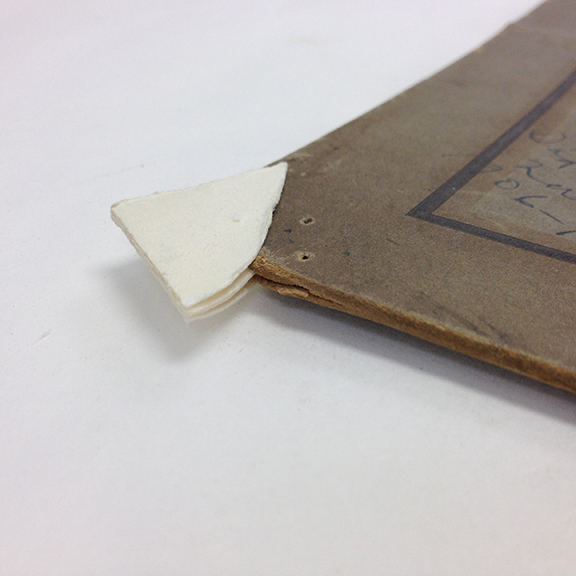 These damaged issues are either repaired by our Conservation Lab staff or, if damage is deemed beyond repair, a request for a replacement issue is placed with our Serials Acquisitions unit. 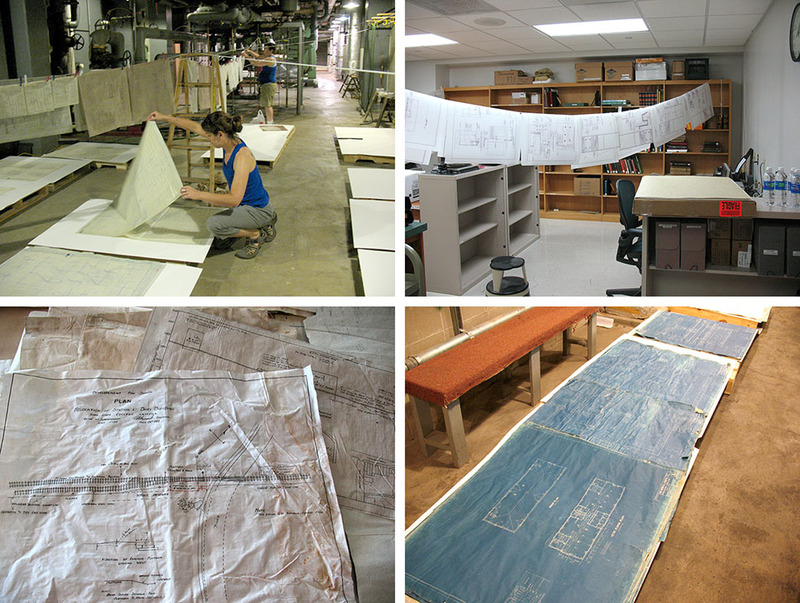 There are three common types of journal repairs which can be performed in our Library Conservation Lab: fill, mend and sew. 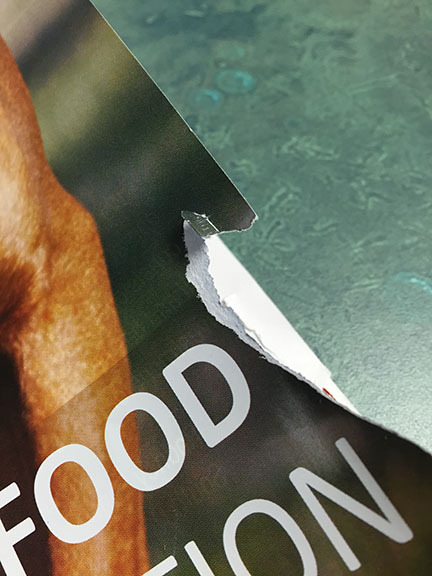 A fill done when there is a hole or chunk missing from the issue and an alternate piece of paper is used to fill it in. A mend repair occurs when there is a rip or tear in the issue, but it is small and generally fixed with repair tape. 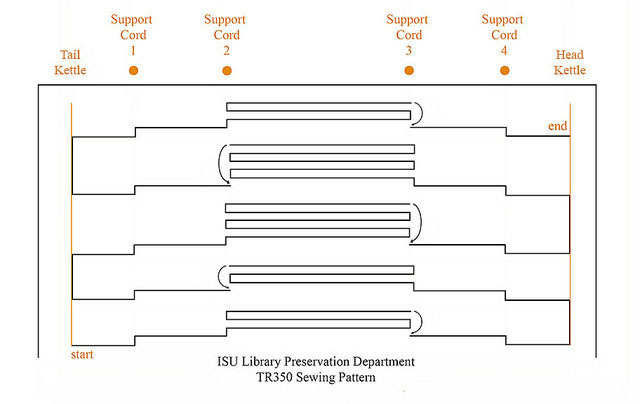 A sew repair happens when the cover or other pages are coming apart from the journal – a needle and thread is used or sometimes glue instead to alleviate this problem, so the issue can remain intact and be ready for use. Close-up of the textured surface of Tek wipe, which is a nonwoven polyester and cellulose blend. 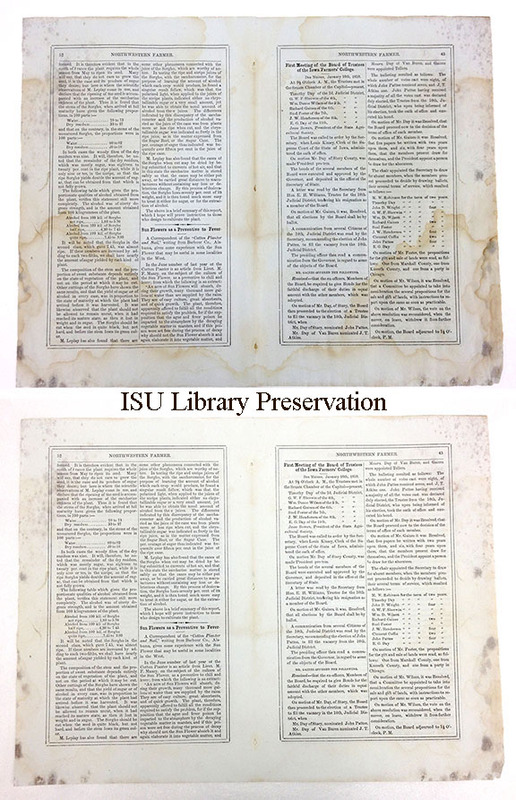 The AIC Annual Meeting in 2014 was abuzz with the virtues of Tek Wipe as a paper conservation material. We had been considering purchasing some as a disaster salvage supply for a while, after seeing how much cotton blotter we used up in the recovery from the Ames Flood of 2010. As the Chair-Elect of the AIC Sustainability Committee, I find the idea of an absorbent non-woven that is washable and reusable to be very appealing. Its reusability makes this material an attractive choice from both an environmental and an economic perspective. However, it wasn’t until I started hearing about other treatment uses for the material that I got over my inertia and ordered some for our lab. Six months of experimentation later, I’m very pleased with Tek wipe’s versatility and results. Tek wipe on a 35″ wide roll. Tek wipe is a highly absorbent polyester/cellulose nonwoven textile which can be ordered by the sheet or by the roll. 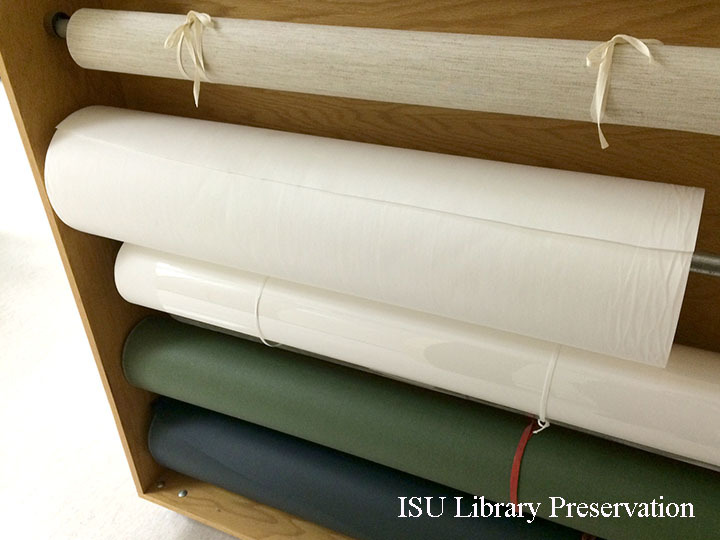 We chose to order a roll and cut it down to sheets that are custom sized for various purposes. We have precut sheets to keep on hand for water disaster scenarios, but I have also been using it for document washing and paper mending in place of (and sometimes in addition to) cotton blotter. For mending, I have used Tek wipe in place of the small rectangles of blotter cut to fit our glass and plexi glass weights. I still sandwich Reemay or Holytex between the Tek wipe and the mend, because the Tek wipe can stick to the mend (or even the paper support itself) if allowed to dry in direct contact. However, where Tek wipe’s versatility really shines is as a washing material. I’ll qualify that assertion by saying my assessments are visual and anecdotal; we haven’t the time or the resources in our lab to assess the results with technical analytics (hint, hint to the conservation graduate students out there…) I’ve been working on a project treating about twenty issues of a mid-19th century horticulture journal suffering from water and mold damage. All of the issues exhibit black and purple mold stains, as well as caked-on surface dirt and pronounced tidelines which fluoresce under UV light. Regardless of whether the tidelines are fluorescing as an indication of mold hyphae or an indication of soluble paper degradation products, reducing them has been a desirable part of this treatment. The project has therefore offered an ideal opportunity for testing out a few different washing techniques with Tek wipe. Tidelines fluorescing under UV light. 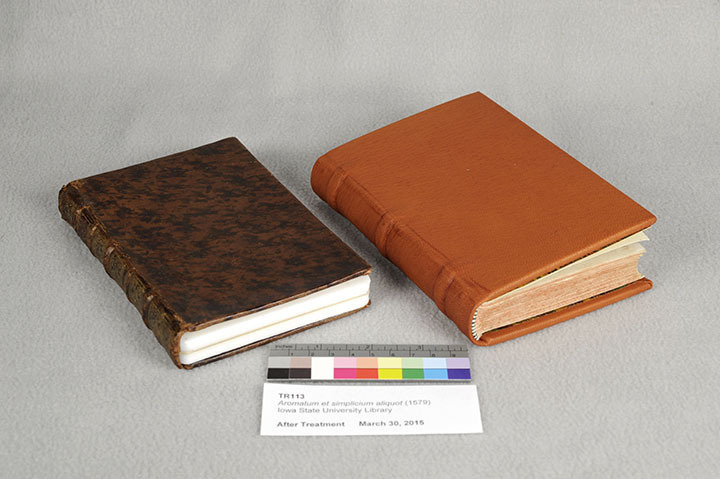 After the initial treatment steps of HEPA vacuuming, dry cleaning, and misting with an ethanol solution, the separated folios of the horticulture journal were then washed aqueously. I tried three different washing techniques with Tek wipe: blotter sandwich washing, slant board washing, and a combination of immersion washing combined with abbreviated blotter sandwich washing. Tek wipe performed usefully in all three scenarios, dramatically reducing the tidelines visible in ambient light and completely removing the fluorescing compounds. For all three washing methods, documents were dried in a blotter/Reemay stack under weight. For the blotter sandwich, I used Tek wipe in place of Reemay or Hollytex. I sandwiched the document between two piece of Tek wipe, then sandwiched the ensemble between two piece of thick cotton blotter. This method worked the best to the naked eye, completely removing all visible traces of the tidelines. All fluorescing compounds were likewise removed with this method. In this scenario, I used Tek wipe in lieu of a fleece, but otherwise followed standard slant board washing procedures. The Tek wipe seemed to wick a bit more slowly than fleece, but the stain was reduced almost as well as blotter sandwich washing, with slight ghosting remaining. All fluorescing compounds were also removed with this method. While trying the above washing methods with Tek wipe proved informative, neither method would be suitable for the scale of this project, which requires the washing of over 200 folios. So, I decided to try immersion washing in combination with a blotter sandwich lined with Tek wipe. Following usual procedures, I washed a Reemay stack with one full issue of the journal in multiple baths of short duration (5 minutes each): two baths in deionized water, followed by two alkaline baths. Even though the water in the final bath remained clear, some visible tidelines did remain in the documents. The documents were peeled one by one from the stack and placed in a blotter/Tek wipe sandwich stack. The documents were re-misted with recalcified water after about an hour, and left for another hour in the blotter/Tek wipe stack. This method greatly reduced the tidelines, leaving behind only faint ghosting, and removing all fluorescing compounds. I selected this method for the remainder of the project because it produced acceptable results in a more time-efficient manner. Before (above) and after (below) immersion washing followed by abbreviated blotter/Tek wipe sandwich washing. Washing the Tek wipe in very warm water and then air-drying it removed the stains the material absorbed from the washing processes above, leaving it ready to be used again. How Are You Using Tek Wipe? Are you using Tek wipe for conservation treatments? We’d love to hear about your experience in the comments section. I’m especially interested to hear if anyone has tried using Tek wipe instead of blotter in a drying stack in a treatment, rather than disaster salvage, scenario, and whether that was successful. What do you like or dislike about the material? Have you had any particular successes or failures using it? Do you have any cautions to share? Please join the conversation! 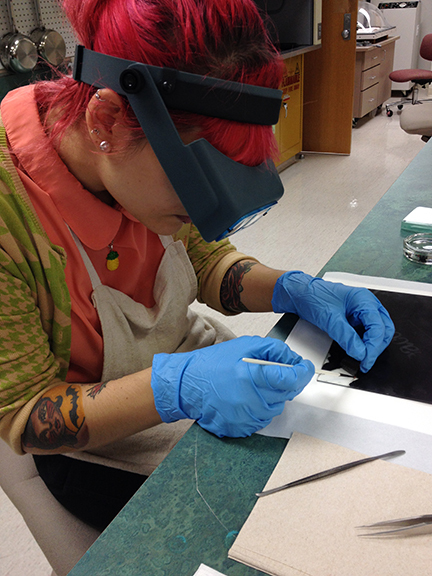 One of the best things about being a conservator is learning new treatment methods and materials. This allows you to expand your knowledge and develop preferences. During my time as a Lennox Intern, I have had the chance to broaden my skills by learning three new treatment methods. The first new treatment I learned is the re-adhering of flaking emulsion on glass plate negatives. Working with a small brush and in small increments, I brushed a 5% solution of gelatin in deionized water on the glass, and then gently pressed the emulsion to the glass. In theory, this is a fairly straightforward treatment. In practice, it proved to be difficult. The emulsion is highly reactive to moisture. Thus, when coming in contact with the gelatin adhesive, it behaved erratically. It was difficult to re-adhere the pieces of emulsion seamlessly, resulting in space between two pieces of emulsion. The end results are not perfect visually, but the emulsion is now adhered well to the glass, reducing any risks of losing any delaminated pieces. 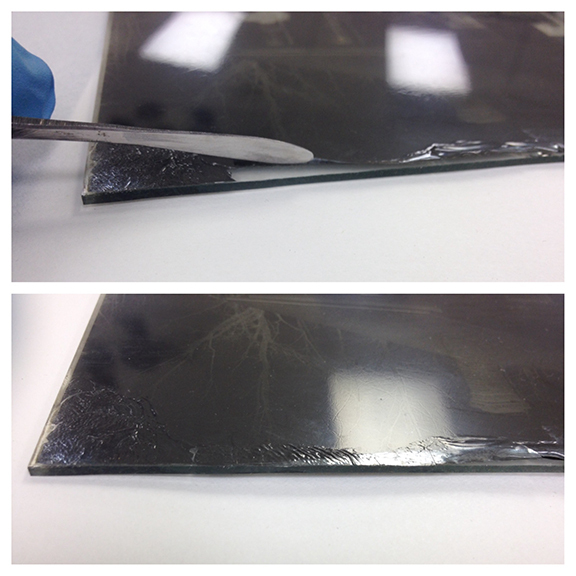 A section of emulsion before and after re-adhesion. Brushing on the gelatin solution. The second new treatment I learned is the re-building of board corners, a technique often done on books which have corners that have snapped off. Some of the photographs in the Van Zandt collection (read my previous post on this collection here) are adhered to backing boards. This was typically done at the photography studio, and all of the backing boards have inscriptions. This means that removing the board would remove historic information, and as a result, repair of the boards with snapped corners was our chosen treatment method. Melissa taught me two ways of building up boards: (1) delaminating layers of archival board until it is the right thickness; and (2) adhering archival board and paper together to build up the right thickness. Then, the newly-made board corners are split and pared, the object’s backing board is split, and they are fit together. 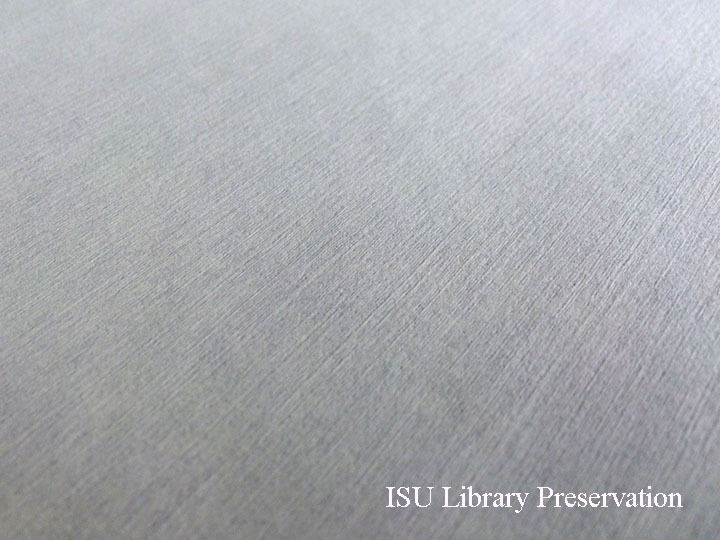 I found this to be a fun process, and enjoyed learning a bit about book conservation techniques. 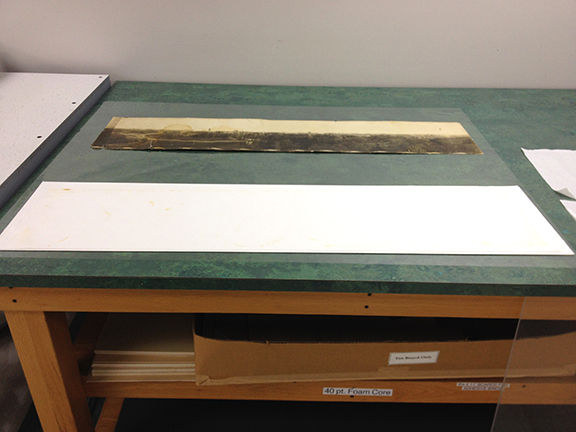 A board edge made of archival board being fitted into the backing board of a photograph. The final new treatment method I will discuss is the use of TekWipe during the washing of a panoramic photograph, which had a significant tideline. I thought this would be a great opportunity to test out a new-to-me material, using the open blotter sandwich method. My set up for this open sandwich was, starting from the bottom: a sheet of Mylar, blotter, wet TekWipe, the object (recto-side up), Photo-Tex tissue, and Plexi. This method meant that the soluble degradation materials would move downward into the absorbent TekWipe. In the end, only a small amount of discoloration moved into the TekWipe, which did not result in much of a visual change in the object, but I did appreciate the opportunity to work with this material. 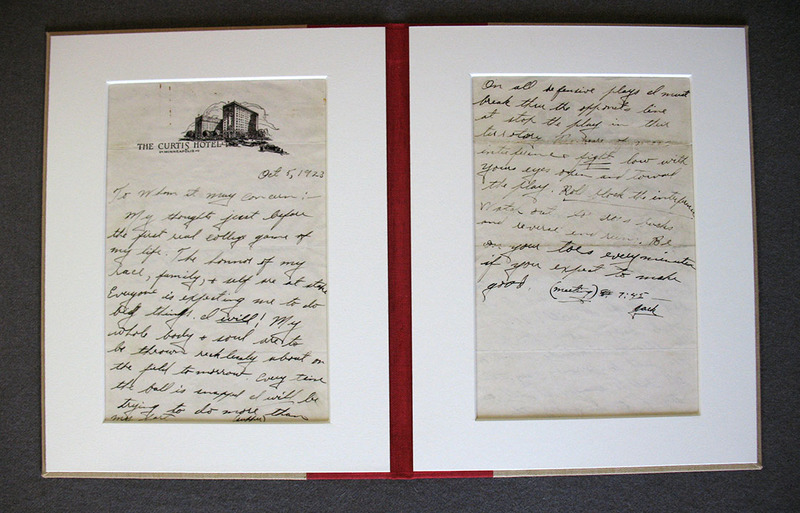 The panoramic photograph removed from the TekWipe, which shows some discoloration that has leeched out of the photograph. The opportunity to try out new techniques is incredibly valuable, and I am excited for future learning possibilities as my time at ISU comes to an end and I move on to the next position. If you’d like to keep up to date with my future conservation endeavors, please feel free to follow me on Twitter or have a look at my blog.